Remember that hilarious party trick where you hang a spoon on your nose? Professional comedy magician, Tom Burgoon, has created a terrific routine based on it -- and he does it in every show where there's a kid in the audience. This routine puts that old party trick on steroids and makes it the perfect way to "test" if a kid has a "magnetic personality." You attempt to teach a kid how to do the old "Hang the Spoon on the Nose Trick." He tries, but CLANK, the metal spoon falls to the floor. You explain he needs more static charge in his body. So you rub his head with an inflated balloon. The result? He's now a "Super-charged Static Magnet!" 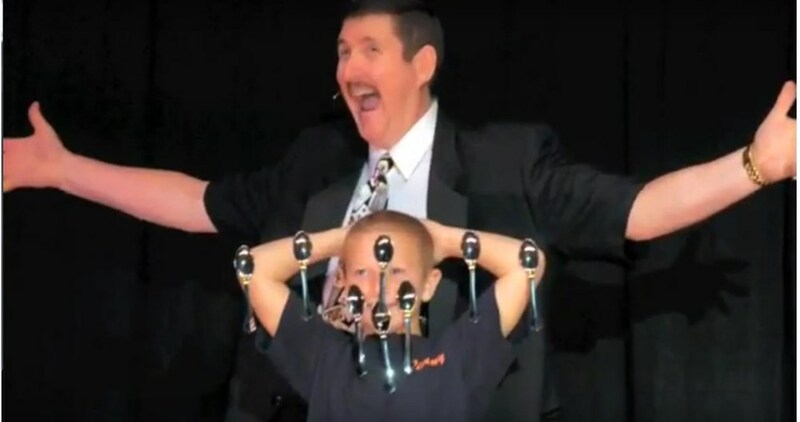 It's all on the AmazeKids video at the top of the page where you'll see that Tom gets eight spoons to "magnetize" themselves to his kid volunteer's arms and face. The visual is incredibly entertaining and a real photo opp. With the right scripting, you'll help boost the ego of any kid in the crowd, turning him into a hero as he does the impossible. When you get Stati-Kid, you'll be performing a routine that literally spoon-feeds your audience the laughs as you build the ego of any kid!